So, first of all, let me show you where I landed up, and of course I will then share with you some of the stations in between. It's a box I plan to use to store my various die-cuts. I tend to die-cut in badged. It's a nice and sturdy box, strong enough to hold all of the product I was planning to use on it. First up a layer of Decoart crackle paste and in places some Wendy Vecchi Gold Embossing Paste, I wanted to make sure I got some of those gold tones in from the start. 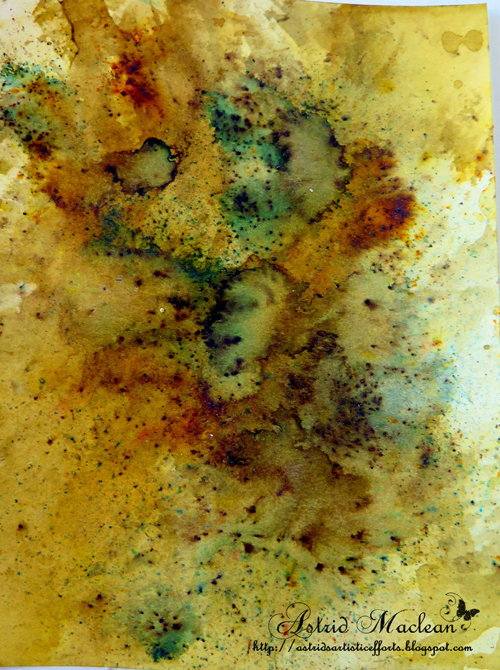 Once dry and nicely crackled, colour was added with the help of Decoart Media Green Gold and Sap Green, and also some Golden brand Iridescent Gold, to bring the gold tones out more. Here you can hopefully see how the darker green sinks nicely into the cracks. 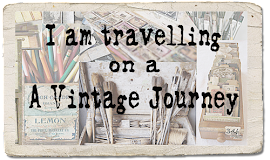 I wanted more of a vintage look however, so next I adding Decoart Antiquing Cream in Raw Umber, wiping it away with a baby wipe from the central bits when it was dry. Now I had decided to cover the top of the box with a separate paper panel (just in case I messed it up), so while things were drying on the box, I started to work on that. 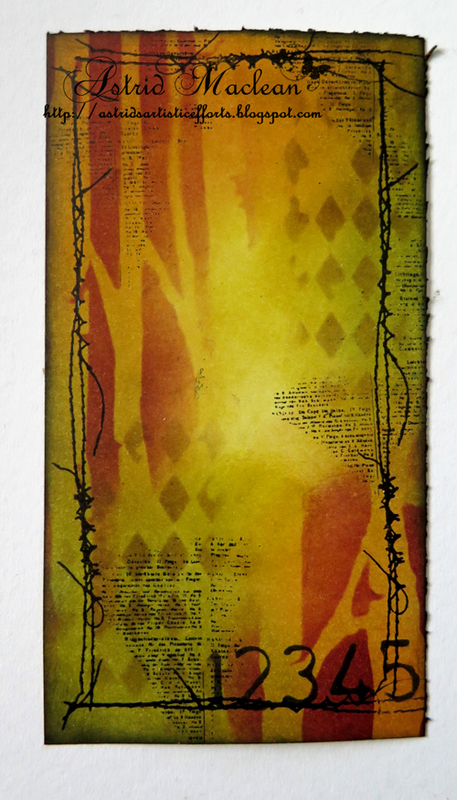 I used Paper Artsy infusions, Lemoncello, Golden Sands and The Sage for this piece, partly straight on to the watercolour paper I was using, and partly on my craft mat, dipping my paper to pick up more paint. Of course everything was blended with plenty of water. 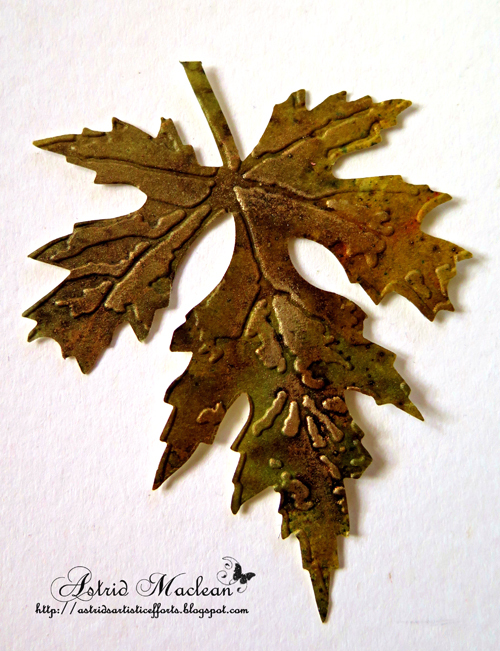 Now this piece was not used for the background, but to cut my main embellishment, Tim's wonderful layered leaf. Some of the raised bits were highlighted with Treasure Gold in a mix of Renaissance Gold and White Fire. 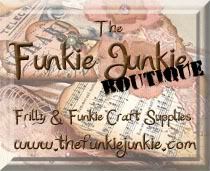 The stencils were all Tim Holtz, the stamps by Gabrielle Polacco and Finnabair. The colours I used were Peeled Paint, Forest Moss, Rusty Hinge and Aged Mahogany. Now all that was left to do was put it all together. I adhered the leaf to the background panel, cut a filigree metal embellishment into quarters for the corner and added a little key to the center of the leaf. A few more finishing touches, adding some shadows around the leaf for more depth, and a die cut word, using gold mirri card, - just looked as if it needed something still. 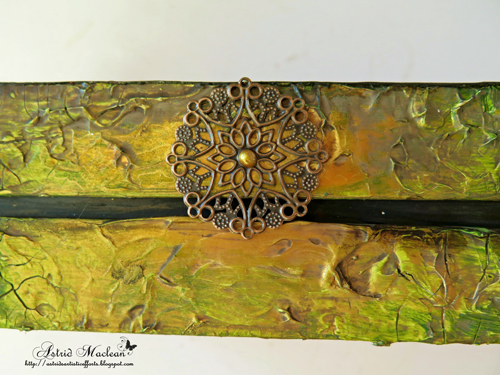 Another filigree embellishment on one of the sides, to show where the box opens. I added a little pearl in the centre of it, using a pearl pen. And here is the finished box, small enough to fit on my craft desk, yet big enough to hold my prepped die cuts ready to go. Well, that's it for today, thank you for travelling along on this first leg of the journey, and be sure to come back next Monday to see what the next Creative Guide has in store for you. I am sure you will not be disappointed! This is absolutely gorgeous, congratulations and thank you for sharing it. 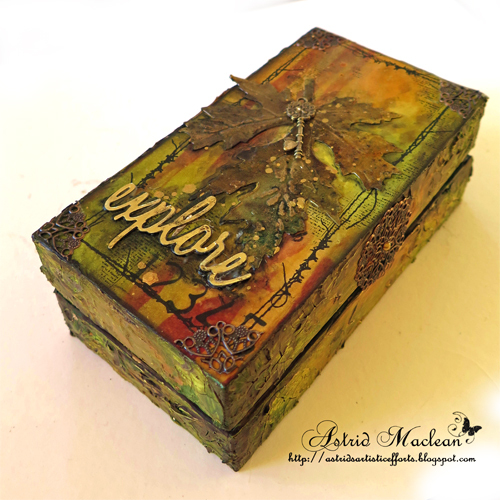 What a beautiful box, and I love the repurposing! Wow, this looks great! I love how crusty the crackles came out! Thanks for sharing it! 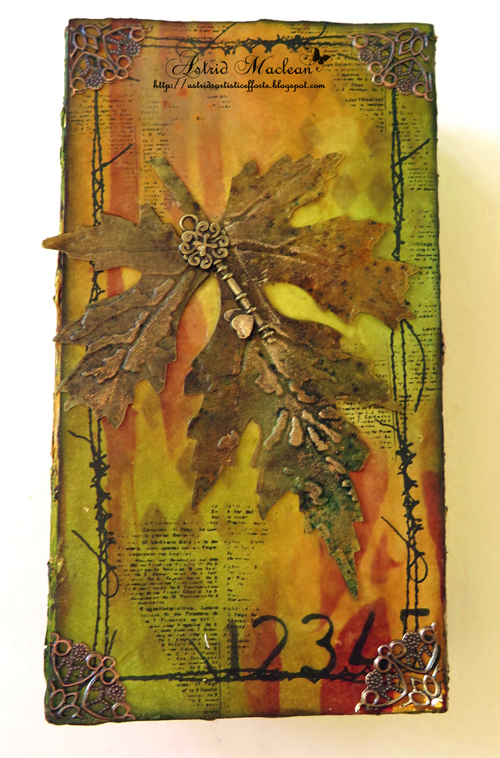 What a treasure you have created Astrid x I adore the amazing textures and rich autumnal tones. 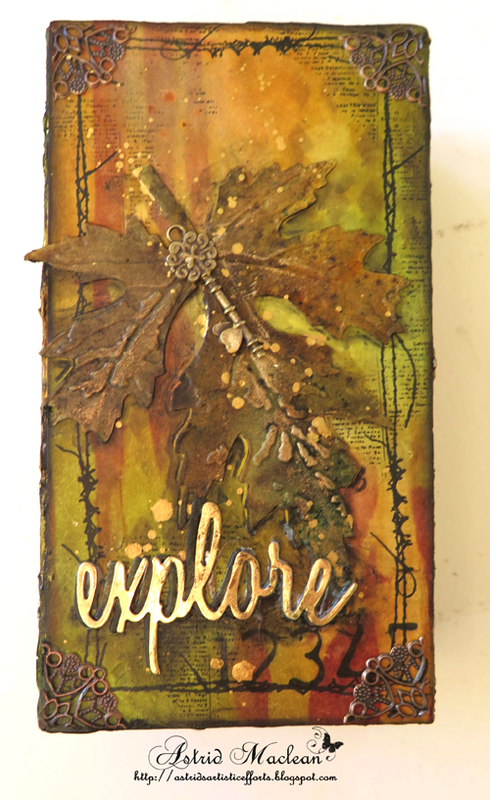 The leaf and key are just perfect as is the word explore. 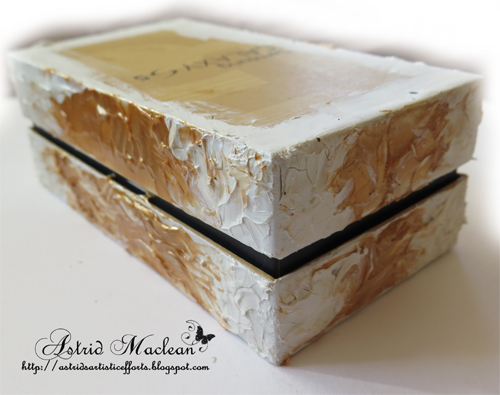 As usual you´ve just done such an awesome job here Astrid, and the box turned out sooo wonderful. I have one of those boxes laying here too, so I might try and do you after on this one. I really love it. Absolutely stunning! Astrid A makeover to die for! Such rich warm colour tones and superb texture with the most beautifully embellishments. Thank you so much for sharing the creative stages and for the inspiration. Beautiful alteration. 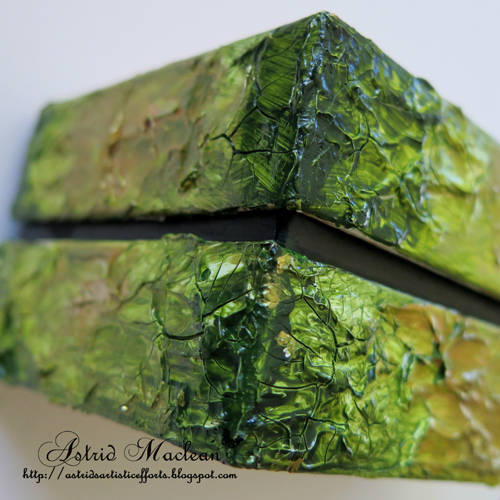 ..love the green popping out and textures so yummm! Great make Astrid. WOW Astrid this is stunning! What a fantastic project, great Automn colours and structure, and beautiful leaf and key, I just love your work, so beautiful !! Have fun and inspire us!! 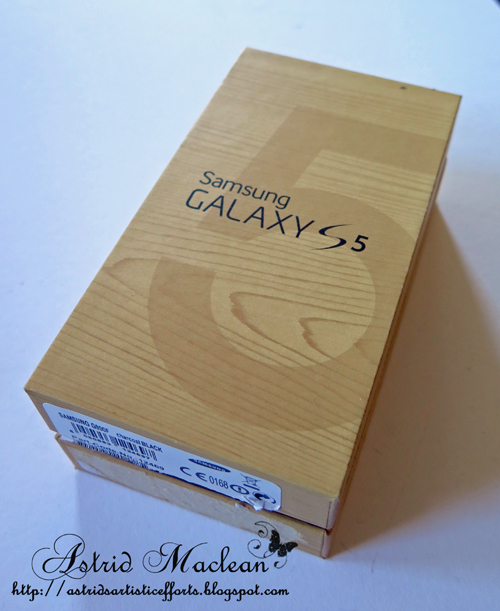 An amazing boxe, I'm in love with it !!! 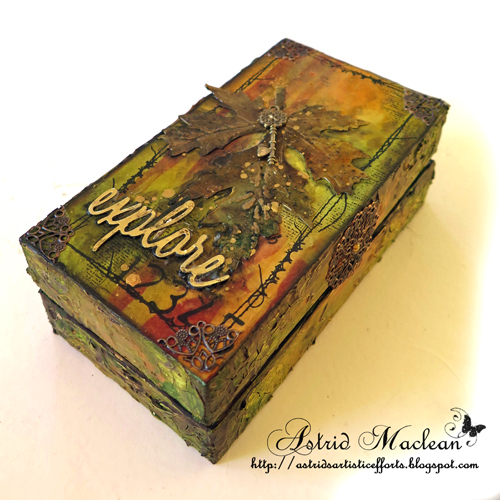 Stunning Autumnal project Astrid, great to see all the different stages on this fabulous box. 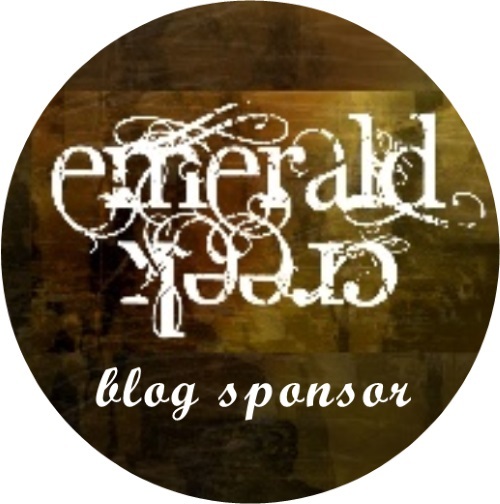 May we display your header here on our new site directory. As it is now, the site title (linked back to your home page) is listed, and we think displaying the header will attract more attention. In any event, we hope you will come by and see what is going on at SiteHoundSniffs.com. This is positively fabulous, Astrid! Love all the step-out photos and of course the big finale. What a brilliant make-over!! Absolutely fabulous!! Love the rich autumn colours and the textures are to die for. A truly amazing transformation Astrid .. pure magic!! Utterly beautiful, Astrid - what an incredible start to the month. The autumnal tones are glorious, glowing with the last of the sunshine; the textures around the edge are fabulous, and the leaf is a stunning centrepiece. Wonderful! Wow, Astrid! Never has a phone box looked so fabulous! I loved what you did to this and how you created such a masterpiece from something so ordinary. You have the true eye of an artist and it was such a treat to be able to see the steps of your creative process. STUNNING!